living space. She’s a peanut of a girl, but wily and very very noisy. For nearly two years now, I have had to put up with the humiliation of having my ears pulled and the annoyance of her poking and prodding me and yelling, “Mow, mow, mow” in my face. Surely a bulldog as streetwise as you has connections? Help me, Loretta. I can make it worth your while to help me. P.S. I am attaching a photo to give you an idea of the conditions under which I am living. I feel your pain. Well, that’s not entirely true. I think I feel your pain. 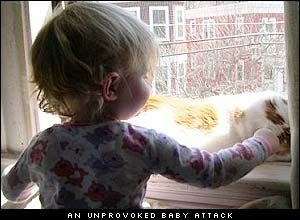 You see, I’ve never been attacked by a baby. I suppose babies are overwhelmed by my strong muscles and intoxicating beauty. But I’ve seen the damage babies have inflicted on my pug brother: ear pulling, tail yanking, fur ripping. OH! Such horror! Try reasoning with the child. I know this can be a Sisyphean task, but I’ve found that a pointed retort can solve most stand-offs. For example, let’s say the Baby tugs your ear. Instead of yelping in terror, you should lower your voice to its most menacing growl and respond: “Baby, you pull my ear again and I’ll feed your face to raccoons.” Crack a small smile and watch as that Baby goes screaming off to mommy! If reason doesn’t work, you need to up the ante. Some pets employ overt attacks — the face swipe, the knock-over, and my personal favorite, the room-clearing gas bomb — but it’s often far wiser to use subterfuge. Possibilities include: a line of tacks mysteriously appears in a high-traffic hallway; a small snake waits patiently in the training toilet; the refrigerator just happens to fall … you see what I mean. And finally, you can take a page from the government’s playbook and spend trillions of dollars on a space-based Baby Attack Defense System (B.A.D.S). In theory, a system of this nature would use a series of satellites to guard against impending baby attacks. Anytime a baby raises its hand or extends its fingers, a laser would beam down from space and zap that baby into submission. Now, everyone knows a Baby Attack Defense System could never work, but a trillion-dollar price tag would lead to worldwide depression. It’s been proven that worldwide depression has a direct influence on baby attacks: when babies are sad, attacks go down — very simple, really. Of course, a system like this will require massive tax increases and the shut-down of so-called “social” programs, but when it comes to baby attacks, no expense can be spared!